you might remember these from this post. My husband can often be found practicing organ in drafty old churches in the middle of the night. 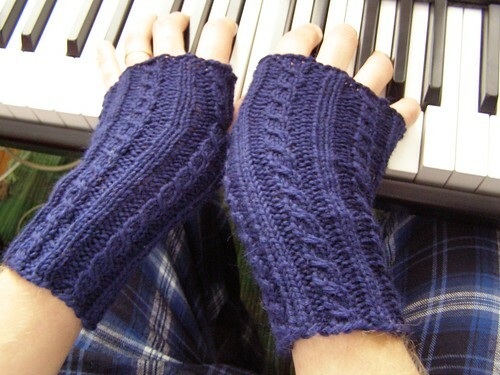 For that reason, our organist/pianist friends are always requesting this style of fingerless mitt. This pattern, based on a vintage men’s sock pattern, has become my standby. Simple and practical, this would also be a great pattern to practice cabling without a cable needle. Size: One size. Because these are stretchy and ribbed, they will fit many sizes. One pair I made fit women’s medium-men’s medium and another (with Cascade 220) ended up being women’s medium-men’s large. Go up or down a needle size as needed. 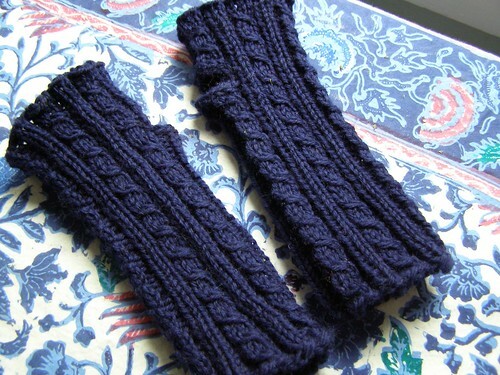 Pretty, I’ll have to keep those in mind for the next pair of fingerless gloves I make.